My first week at The Feminist Press, I had the whirlwind experience of hosting a visiting author from London for her weeklong NYC book tour. 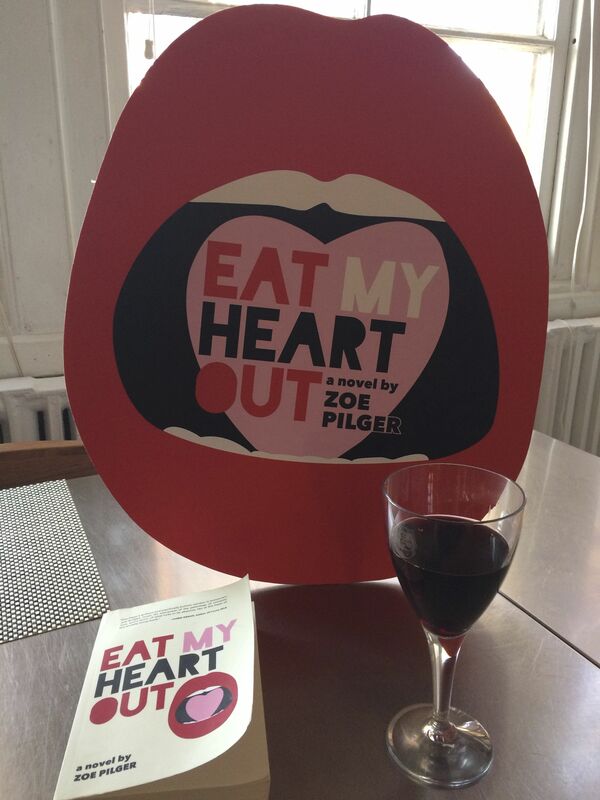 The author, Zoe Pilger, came to the U.S. to premiere her debut novel Eat My Heart Out. The novel follows Ann-Marie, a recent Cambridge drop out, dumped by her longterm boyfriend, and wandering listlessly through the London art and hipster scene. Her story is a feverish, ten-day journey of self discovery, marked by cringe-worthy sexual encounters and friendship with an abusive second wave feminist. It’s also quite funny. What it is not is meek or apologetic, just like the protagonist. Zoe and I sat down last week to discuss her book, its themes, and possible areas to explore through essays. One of the disheartening things Zoe told me was that many readers responded to her work by discussing how they didn’t like her protagonist and how that affected their overall opinion of the book. Funny, I thought, how often that critique comes up with books featuring female protagonists. Somewhere in our literary history, it was decided that female main characters must be likable in order for the book to be enjoyable. I don’t feel I need to like a protagonist in order to like a book. I need to believe in that character. If the character’s motives don’t align with their actions or if they do anything that forces me out of the story, then I struggle with the character. But not every protagonist can be a saint, and who decided that the role of sinner belongs only to men? Zoe’s book reminded me greatly of The Catcher in the Rye–the short amount of time in which the story is set, the rapid advancement of plot careening towards an end with the expediency of youth, and the main character at the center who is desperate, lost, and quickly shedding her/his naiveté. Think about Holden Caulfield. He is whiny and practically unbearable, and yet The Catcher in the Rye is still taught every year in high schools across the country. While reading Eat My Heart Out, I also enjoyed an early copy of Tin House’s late summer release The Scamp, a hybrid literary-mystery by debut novelist Jennifer Pashley. It too features a damaged young female protagonist and another character, a serial killer, who is quite unlikable (as you would suspect a killer to be). Again, I didn’t feel this was a problem. I don’t think females should be limited in their “badness” because of their gender. I remember a publicist once lamenting about a book her house had put out featuring a mother killing her children. The book did not do well, she said, because people didn’t want to read about a mother committing such atrocities. And yet, they do. Women are capable of the same evils as men, so why do we think our stories about women should forget their humanness, their mistakes, sins, and crimes? There are countless stories of reckless men, from On the Road to Bright Lights, Big City, that Eat My Heart Out could align with, just as there are countless stories of disturbed, violent people of which The Scamp continues the legacy (think of the protagonist of The Stranger). And yet, these stories that feature women behaving badly earn a special kind of stigma, unfair and unearned. I’m thankful for Eat My Heart Out and The Scamp because they allow women characters to be fully realized, flaws and all. Hi. Sorry if my comment won’t relate on the topic that you have posted. May i just ask how did you remove the wordpress in your url? You pay a little extra for a premium WordPress site and domain name.